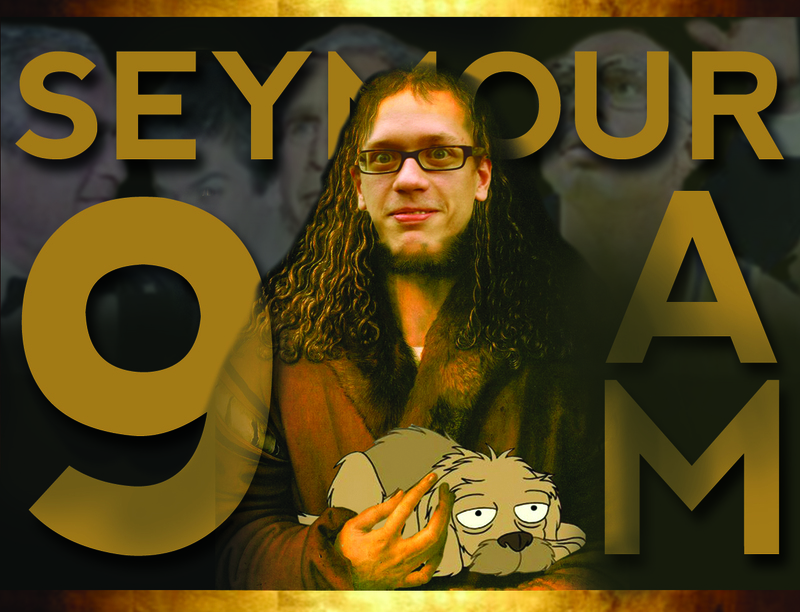 Seymour 9 a.m. shows itself. This week saw the unveiling of Nick’s SweetWater IPA clone. I pressed Nick for weeks to name the beer, the results becoming more and more outlandish with each request. The name he eventually settled on and would not budge from regardless of continued prodding was Seymour 9 a.m. Colleen, being in charge of label design, chose to run with it as wildly as her imagination could manage. I think the results are very fitting for Nick. Even better, he’s happy with the brew, although we agree that it’s lacking a bit of the hop wallop one expects from an IPA. For the tasting notes, I usually write up my thoughts the day before in order to minimize the thinking I have to do while managing the pizzas. However, this time the beers we cracked open to have with the pizza were significantly better than the one I tried the day before. It’s been striking how much variation I’ve had within batches from bottle to bottle based on age and length of refrigeration. Appearance: I’ve had four of these by now, and two have poured with no head despite an aggressive pour. However, as pictured above, some pour with a one finger cap of fine bubbles, dissipating over the course of a couple minutes. Lacing is minimal. Hazy, somewhere between bronze and copper. It will probably clear up significantly with age, but by then some of the hops will have faded. Mouthfeel: A little thin. I think in the future I might play around with the amount of wheat in the grist. Nick really liked the malt flavor in the Gold Ale clone, which has more wheat and no Munich. I’ll probably shoot for a middle ground in future iterations. Just as the head has varied from bottle to bottle, so has the carbonation. It’s always fairly subtle, which I like for this style. I think this is just a symptom of the beer being a little young. Aroma: Disappointingly little. I’ve read that it’s fairly difficult to get hops to come through in the nose because the aromatics tend to dissipate first, so even with dry hopping, after three or more weeks in the bottle, those volatile compounds may have already dissipated. However, what surprises me is that there isn’t even much of a malty aroma in the hops’ absence. Flavor: This is actually where this brew really delivers. The malt is definitely a supporting player to the hops, provided a pleasantly sweet backdrop for the hops. They seem to lie somewhere between citrus and berries. Despite a strong grapefruit flavor to the gravity samples I took before bottling, no particular fruit jumps out at me now. 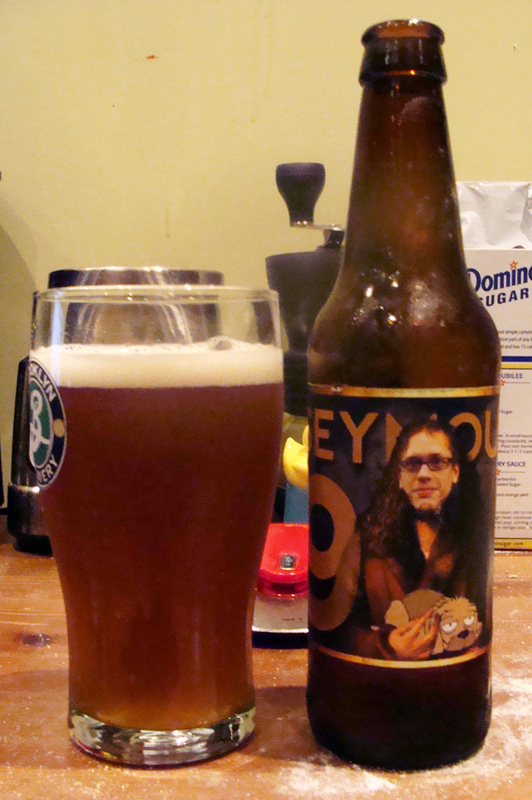 Also, while the hop flavor is pleasant and in balance, there is not enough bitterness to this brew. Overall: I’m surprised that I don’t think the recipe will require much modification moving ahead. I’m pretty pleased with the grain bill already, though the hops will take some more adjustment. Hopefully increasing the wheat will also yield more lacing. In truth this pairing wasn’t particularly strong. The flavors of the beer and the flavors of the pizza didn’t really communicate with each other very much. I was hoping for the seitan to come out savory and slightly smoky, but it was actually quite sweet. I marinated the seitan in soy sauce, olive oil, garlic, black pepper, and apple cider vinegar for about a day. No oil and no sugar, along with Caputo flour, gave me a very pale crust (although not lacking in flavor or texture). I also tried a new dough for this pizza. For this dough I used a 50/50 mix of King Arthur Bread Flour and Caputo 00 Chef’s Flour (supposedly the same flour as their Pizzeria Flour, but sold in 1 kg bags for home consumers). My recipe was 26 oz total flour and 58% hydration, 1.5% salt, .05% yeast in baker’s percentages. I mixed and kneaded the dough until it was smooth, and then let it bulk rise covered at room temperature for about 18 hours. I then divided the dough (which had unfortunately dried out on top), kneaded it until smooth, formed it into three balls, and let it continue to rise for 4 more hours. Since the dough contained no oil or sugar, it didn’t brown much in the oven. I have read that Caputo flour also naturally produces a dough that does not brown easily, though I am not yet sure why. Despite the pale pizza, I found the flavor to be pretty well developed, and the texture to be close to how I like it. 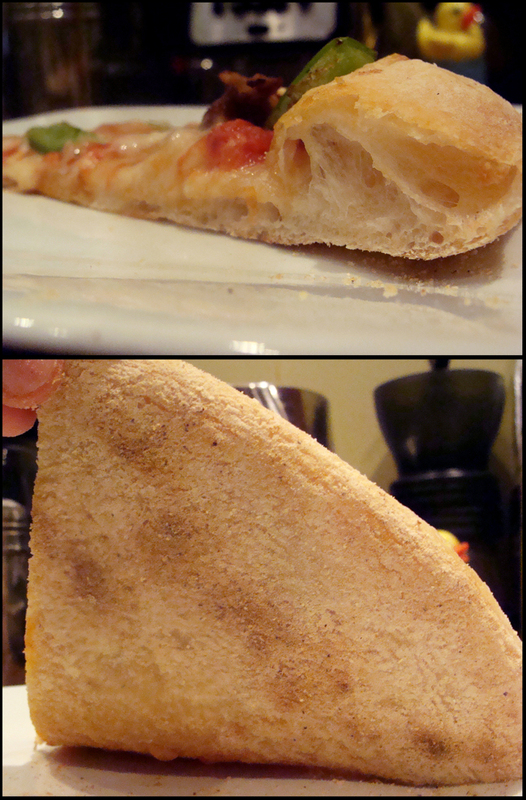 The crust has plenty of chew, but was close to being tough, and in spots the crumb was dense rather than open and airy. The crust also ended up with a lot of bench flour on it, which is a problem I will continue to work on. On the upside, the dough was very easy to work with, both extensible and elastic. At no point of opening up the dough ball was I concerned about tearing, and I didn’t have to wrestle with it to form it into a 13″ pie. Springing for Caputo flour may have been premature, given that I still have much to learn about flour and dough fermentation as well as much to practice when it comes to handling the dough. Soon I’ll start taking some greater care with quantifying and controlling my methods. Update (6/10/2013): I just drank the last of these beers. There is still a slight grapefruit note to the nose, and the beer now pours a lovely clear deep copper hue with a dense sticky head. The flavor is a combination of solid sweet malt, citrusy grapefruit, and even berry-like hops. The finish is surprisingly clean despite the strong malt backbone. This is my favorite brew of mine so far. This entry was posted in beer, learning, pizza, recipes, tasting and tagged cornmeal, dough, fermentation, flour, pairing, sweetwater on May 17, 2013 by Dylan Bargteil.